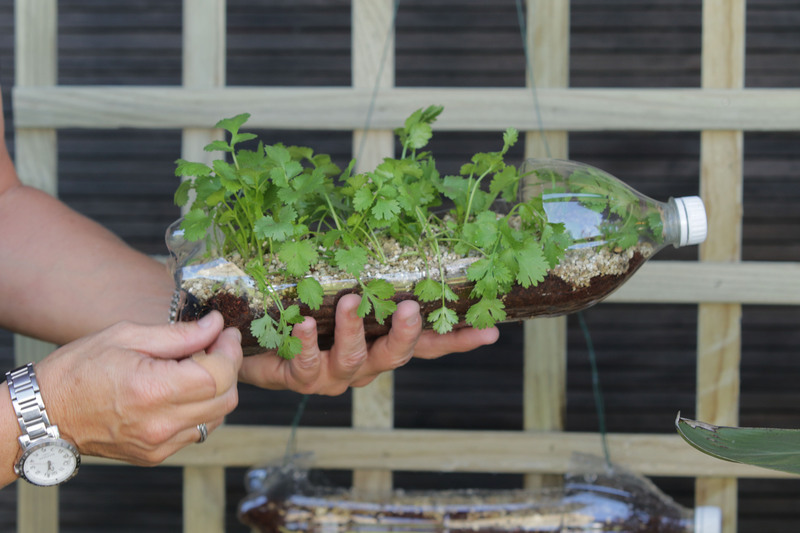 Plastic cool drink bottles are great when it comes to germinating seeds and growing seedlings, as they act as a mini greenhouse. Start by cutting a plastic bottle one-third from the bottom using a cutting knife. Drill drainage holes through the base of your plastic bottle container. Fill the container (bottom part of the plastic bottle that you have cut off) with your potting soil mixture to the top. 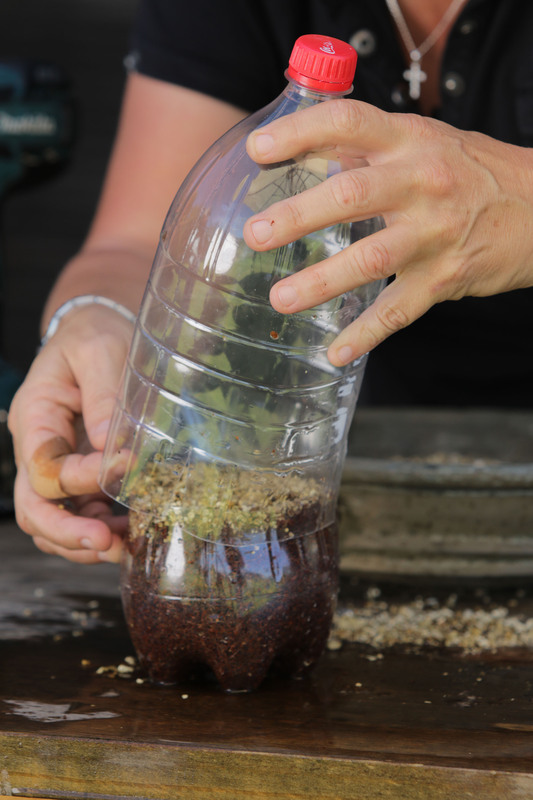 Sprinkle seeds on top of the potting mixture and cover with a layer of vermiculite. Lightly firm the vermiculite down using a block of wood or the palm of your hand. Give a light watering until water drains from the bottom of the plastic container. This will be the last time you water the seeds until they have germinated. Using the top part of the plastic bottle that will aid as a cloche/lid, simply make three small incisions at the base of the cloche (where you cut the plastic bottle in half) to allow the cloche part to slip over the base container. This will form your little plastic bottle greenhouse. Place your greenhouse in a well lit spot (not full sunlight) and allow to germinate. 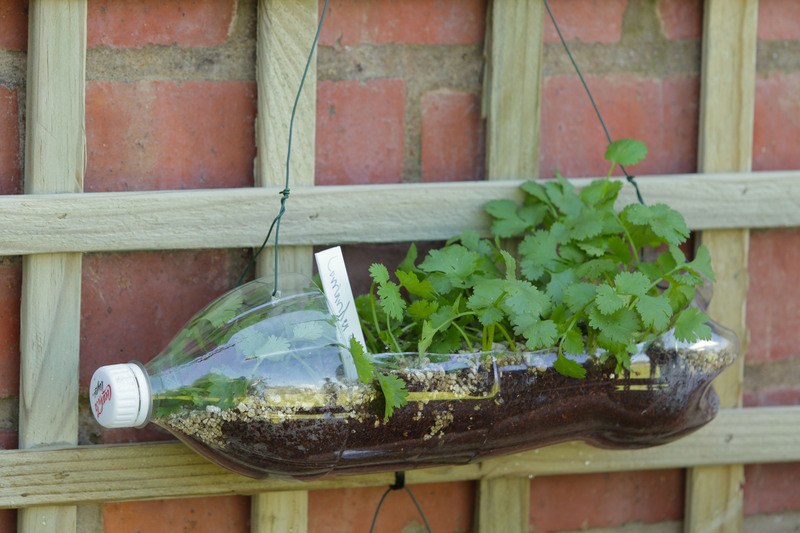 Once the seedlings have reached the first leaf stage, simply remove the bottle cap to allow for some airflow. When the seedlings are strong enough, simply remove the cloche part of the plastic greenhouse and either plant out or pick straight from the plastic container. Start by cutting a rectangular shape out from the side of a plastic bottle (in the length of the bottle). Puncture/ drill two holes on each side of the plastic bottle to allow the bottle to be hung onto a trellis using wire, as well as holes for drainage. Fill the container to the top using potting mixture and sow the seeds of your choice. Important to note that a pumpkin seed will be overkill as you will have to plant the seedling out at some stage. Best to stick to herbs and smaller plants. Cover the seeds with a layer of vermiculite. Thread some twine, cable or wire through the holes to hang the plastic bottle. Find a spot to hang the plastic planter (make use of a cable tie). This container you will need to water every 1-2 days. Prepare the layout of your scrap wood on a flat surface, by placing them side-by-side in an upright jagged sequence. Determine an appropriate size for your table based on the length of each piece of wood e.g. 600mm x 300mm. Cut each piece of scrap wood to the desired depth of your table e.g 300 mm. The length of the table will be determined by the number of pieces placed side-by-side e.g. 600mm. 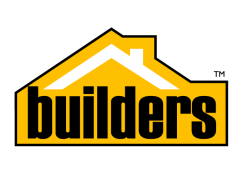 Before drilling pilot holes, use the smallest width of scrap wood and draw a guideline on each piece. Mark and drill pilot holes, alternating between 3-4 pilot holes, below the guideline to ensure your screws secure into the next piece of wood and do not screw into each other. Use the clamps to ensure correct alignment of each piece of wood when applying glue and screws. After applying wood glue, screw each piece of wood together to create a permanent bond. 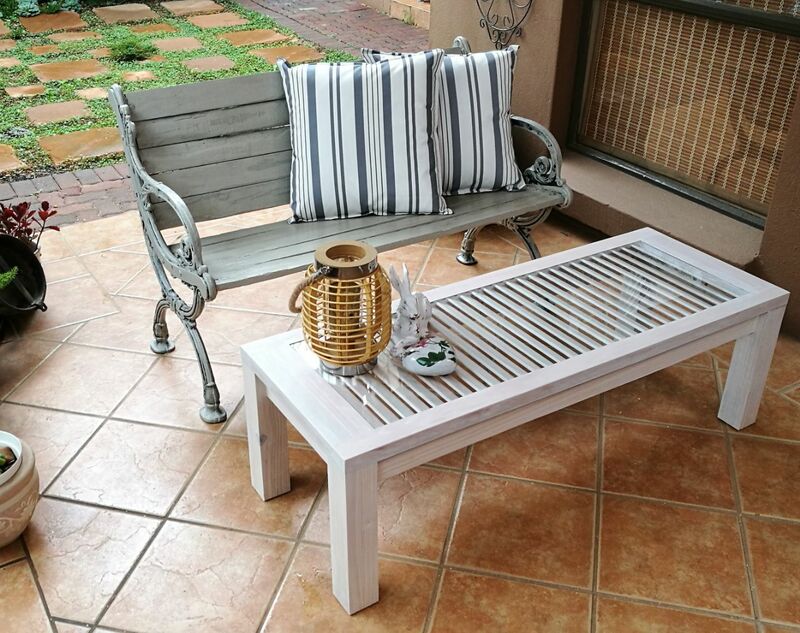 The side of the table is made using 4x rectangular pieces of shutter-ply wood (18mm x 300mm x 700mm). Secure into the table top. 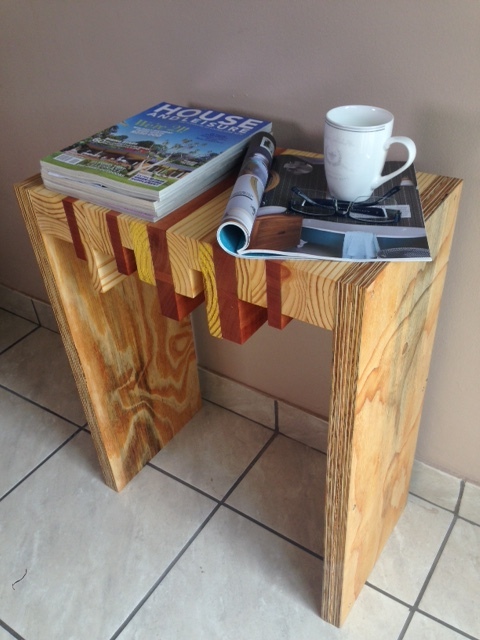 Alternatively, use square timber at each corner and secure to your table-top. Sand off any uneven surfaces to ensure a smooth table top and sides. 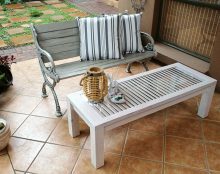 Apply a Linseed or Teak oil to protect the wood to ensure durability. Start off by deciding on the height of your coffee table (350mm is a good height). Measure out the length of the four legs and cut to size. 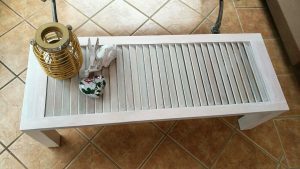 Place a leg in each of the four corners of your table top (shutter), and measure out the length of the slats the will make up the frame of the base. Cut these slats to size. When cutting the timber to size, it is advisable to measure and cut one piece at a time, to ensure you take the blade width into account. With the base or box frame now cut to size, it is time to add pocket holes which will aid in securing the different pieces of the base together, as well as secure the base to the table top (shutter). Using a pocket-hole jig system, drill the pocket holes into the side of the slats that will secure into the bottom of the table top (shutter), as well as pocket holes on the ends that will secure into the four leg posts. You want all your pocket holes to be on the inside of your project so that you cannot see them. Be sure to read the tool instructions before first time use. With all the pocket-holes now drilled, it is time to secure the base frame together. Find the center point of the ends of the slats and line them up with the center points of the corner posts. Attach the different pieces using the jig screws and impact drill. Start with the frame and finish off by securing the frame to the bottom of the table top. With the table now assembled, simply give the entire project a light sanding to remove any sharp edges and dust off. Applying two coats of tinted wood sealant, adds colour and protection to your project. An optional extra would be to add a glass inlay on the top part of the coffee table. Simply measure the relevant size and have your glass cut to size.